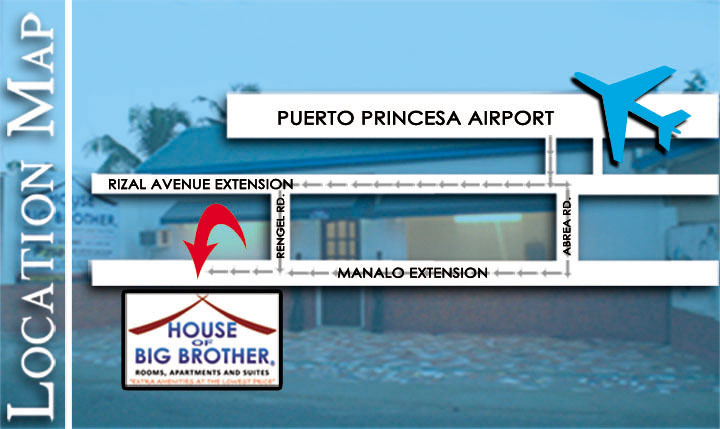 (Note: This is different from the rooms of BigBrother Condotel at Rizal Avenue, Puerto Princesa City). REGULAR RATE- Inclusions: Breakfast, airport pick up, use of pool. Maximum of 2 persons. PROMO /ADVANCE BOOKING RATE- Inclusions: Breakfast, use of pool, airport pick up. PROMO ADVANCE BOOKING RATE: WITHOUT breakfast, use of pool, airport pick up. REGULAR RATE- Inclusions: Breakfast, airport pick up, use of pool. Maximum of 4 persons. •	PROMO ADVANCE BOOKING RATE: WITHOUT breakfast, use of pool, airport pick up. REGULAR RATE- Inclusions: Breakfast, airport pick up, use of pool. Maximum of 3 persons. PROMO ADVANCE BOOKING RATE: WITHOUT breakfast, airport pick up. •	PROMO ADVANCE BOOKING RATE: WITHOUT breakfast & airport pick up. Use of pool is FREE. REGULAR RATE- Inclusions: Breakfast, airport pick up, use of pool. Maximum of 6 persons. PROMO ADVANCE BOOKING RATE: WITHOUT breakfast, airport pick up. Use of pool is FREE. * Extra Person/ Extra cushion: Php 400. * Children 7 year old above is counted as adult. SET BREAKFAST MAYBE ORDERED IN ADVANCE AT ADDITIONAL RATE STARTING AT P150 PER MEAL SET. THERE IS SWIMMING POOL FEE THAT COVERS TOWEL, LIGHTING, PUMP, GUARD AND SHOWER COST. UNITED STATES DOLLAR EXCHANGE RATE IS USUALLY AT 40 PHILIPPINE PESOS TO EVERY ONE UNITED STATES DOLLAR. AIRPORT TRANSPORT STARTS AT AS LOW AS P10 PER PERSON FOR 4 MINUTES PUBLIC TRICYCLE RIDE TO AIRPORT OR AIRCON SHUTTLE VAN OF P200 PER TRIP OF SIX PASSENGERS. ALL ROOMS ARE NON-SMOKING AREAS EXCEPT THE VERANDAS.